Blurb from the publisher: When Oliver’s explorer parents go missing, he sets sail on a rescue mission with some new, unexpected friends: a grumpy albatross, a nearsighted mermaid . . . even a living island! 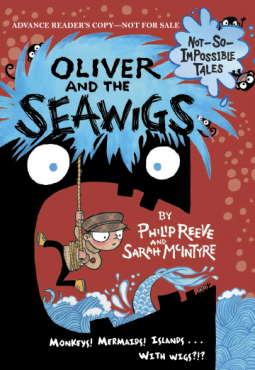 But the high seas are even more exciting, unusual, and full of mischief than Oliver could have imagined. Can he and his crew spar with sarcastic seaweed, outrun an army of sea monkeys, win a fabulous maritime fashion contest, and defeat a wicked sea-captain in time to save Mom and Dad?